Through our network of associates and affiliates, we are able to offer US serviced offices or a USA virtual office in any State, any size office. Just tell us what your workspace requirements are, and we’ll do the rest. We can source a USA virtual office for you. Simply put, this offers all the benefits of traditional US serviced offices, without the need to physically occupy any office space. A USA virtual office will provide a telephone, fax and mail forwarding service that gives your clients the impression they are dealing with a company based in a prestigious location when, in actual fact, you can have the flexibility to manage your company from anywhere in the world. We’ll source a provider that will offer you the best deal as well as offering you a wide range of services to pick and choose from, such as a US virtual mailbox with a prestigious address and a telephone answering service. 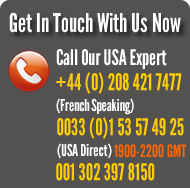 How you benefit from a USA virtual office is entirely up to you and your requirements. Please use the enquiry form below to tell us your exact virtual office, serviced office or US virtual mailbox requirements.